A project of The Friends of the Wild Flower Garden, Inc and the Minneapolis Parks and Recreation Board. 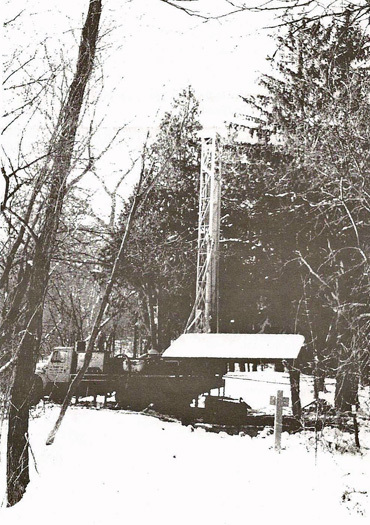 The E. H. Renner & Sons drill rig at the site of the Great Medicine Spring, January 1999. Photo Friends of the Wild Flower Garden. 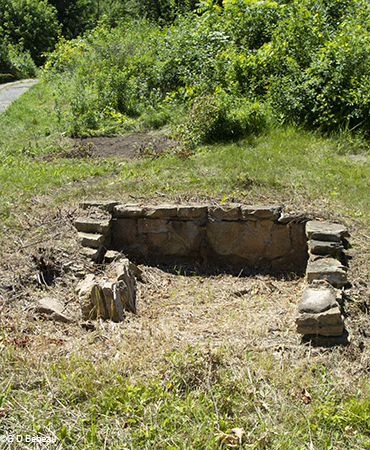 The Great Medicine Spring became part of the history of The Friends of the Wild Flower Garden when The Friends agreed to fund a new well to try to reactivate the spring. In the Spring of 2000 Friends President Steve Pundt wrote about the history of that involvement. Subsequent events which led to the virtual abandonment of the old spring are also reported below. Saratoga Springs was the original name of the area within which Wirth Park (originally Glenwood Park) was created, and, as the name suggests, there was a time when the area’s water table was much higher and springs and seeps were everywhere. 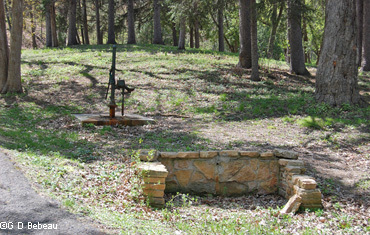 Friends' member J. S. Futcher remembers that when he was a kid in the 1940s there were three main springs in the area of Garden - the Great Medicine Spring being considered the main one; another on the northwest corner of Glenwood and Theodore Wirth Parkway; and one to the east of the back gate of the Garden. (Read more of Futcher). There was also a spring in the Garden wetland. Gardener Cary George noted in 1990 that since 1987 the flow from the Great Medicine Spring had been minimal (1), and that in 1989 it was dry; former Gardener Ken Avery suggested that perhaps a hand pump could be used to still obtain water. More Background: See this article for a series of first-hand accounts by the Garden curators and gardeners, concerning the activity of four natural springs in the area of the Eloise Butler Wildflower Garden and Bird Sanctuary in Theodore Wirth Park, Minneapolis, covering the time period 1934 to 1990. 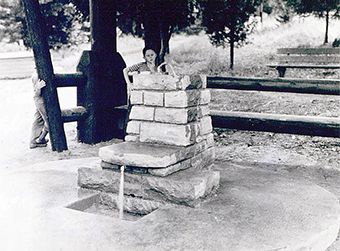 The new fountain on the Great Medicine Spring, installed by a WPA masonry crew in 1939. Photo by Walter Dalhberg, 1939. The fountain was permanently removed at the end of 1954. Click on image for a larger photo. The new canopy over the new fountain on the Great Medicine Spring. 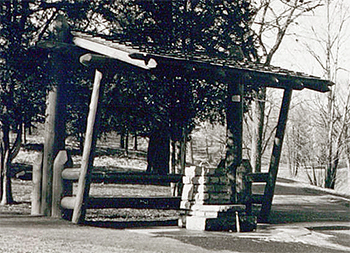 Canopy built by Park Board carpenters and installed after the WPA masonry crew finished the fountain in 1939. Photo by Walter Dalhberg, 1939. Click on image for a larger photo. "In her carefully researched biography of Eloise Butler, Martha Hellander wrote that the spring located southeast of the intersection of Wirth Parkway and Glenwood Avenue was apparently the Great Medicine Spring which had been described in 1880s articles and books about Minnesota geology and history. It was reported that Indians traveled great distances to drink from the spring because of the medicinal properties of its water. 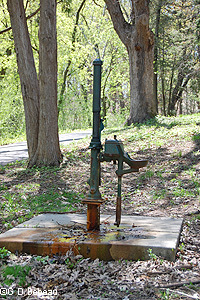 To increase the water flow and quality, the Friends’ Board hired Renner Well Company to drill a well at the site of the spring. [The well was completed on January 29, 1999] The result was disappointing. The water was no better. It turned yellow and tasted bad, not all what we remembered. The Renner Well people have been great to work with. At a special Board meeting in February , they explained that the “spring water” we remembered was probably from a shallow well, primarily fed by rainwater. The old well pipe is only about 30 feet down, based on Renner’s information about the Park Board wells which date to 1906-1912. 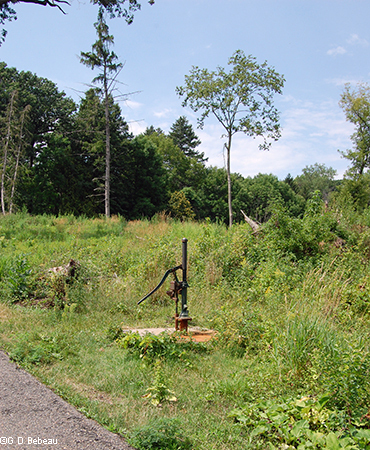 Other wells in the park system are much deeper, 300-450 feet, into the Shakopee-Jordan aquifer. When drilling our well, Renner hit a strong flow of water at only 135 feet down. Drilling all the way down to the aquifer would have required double casing and would be very expensive. Renner recommended pumping out a large quantity of water to try and clean the spring water. This was done at the end of March . The results were good. Taste and clarity were improved. Text in [ ] has been added for clarification of events. The above was the state of affairs in the spring of 2000. There were new developments in 2000. The spring did not flow at the previous rate. A report dated February 15, 2000. was received by the Friends from Renner & Sons. They addressed the reduction in flow from the spring. During the winter of 1999-2000 the well had been allowed to flow freely (as Steve Pundt mentioned in his article) to prevent freezing and now a hand pump was discussed as the practical option to install. Below: The configuration of the new well placement with its connection to the old spring drainage basin. Diagram by E. H. Renner & Sons. The hand pump was installed in the summer of 2000 but water flow declined even more from the initial good flow and the purity of the water was in question. In addition, landscape work around the new well construction site still had to be finished. Eventually, public access to the spring was discouraged, first by the Park Board removing signage about the spring from the parking lot area along the entrance road to the Garden and then several years later by removing the spring parking area entirely. The landscaping completed around the well and drainage basin is shown in the photo as it was 2008. On May 22nd, 2011 a powerful tornado began its destructive path near Glenwood Ave and Theodore Wirth Parkway, just west of the old spring. 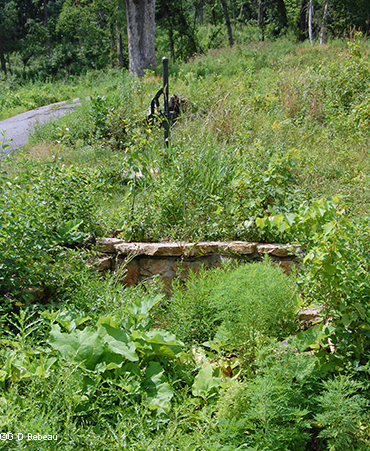 There was damage within Eloise Butler Wildflower Garden, but the heaviest damage was just to the north, including the area of the old spring. 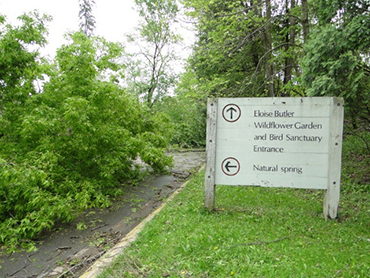 The photo of the Garden entrance road was taken by Judy Remington just after the storm. 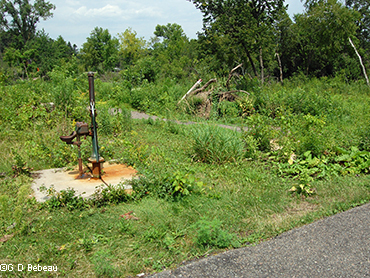 The other three photos show the condition of the site 14 months later on July 25, 2012. Gone are the trees and the appearance of previous landscaping. Water still drips from the pipe outlet of the spring, but all is abandoned and nature begins her reclaiming process. (Site photos - G. B. Bebeau). 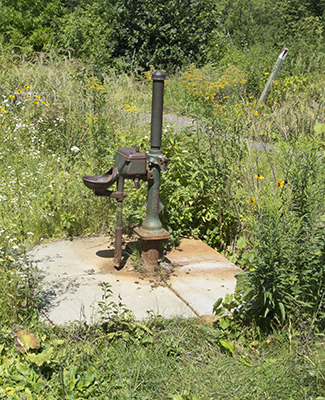 In 2014 the hand pump handle was removed so that people could not attempt to pump water as testing indicated the well had contaminant issues. In 2018 the contaminants of bacteria and arsenic exceeded maximum allowed levels. The 1st photo shows the pump in the Summer of 2014. The second photo shows the scene after the pump, well pipe, concrete pad and valve box were removed on June 25, 2018 and the well capped. Note 3. Martha Crone's diary - 1939, references this work done along with work at the spring in the Wildflower Garden.